I foresee this as the first of several extras of this type. chapter 8 starts on tuesday! also, I’ve tweaked the layout a bit (you may have to force refresh), and am currently working on updating chapters 1-4 at a bigger size with the new font. food can be weirdly relaxing to draw! also a fun challenge to speculate on western cuisine in a place with no dairy. would any of the foods here be a favorite of any characters we’ve met so far? and there is actually a bit about that question in the print volume! primrose absolutely hates cactus leaves, especially steamed. her favorite food is custard bread, which is like one of those curry buns, but filled with sweet egg paste. lucky’s favorite food is roasted fish–saddlefish primarily, which she only got to eat on her birthdays, due to dejado being far from the ocean. her least favorite food is thornplant soup, a very common food in her area, which literally tastes like dirt. moss comes from up north, where the cuisine is entirely different. he’s encountering most of this food for the first time. celestino just likes anything expensive and flashy. tigertail’s tastes vary widely, as she’s had to adapt to eating whatever she can steal at times, but she is partial to spicy food. wildflower has a sweet tooth, so she’s a fan of cactus fruit and janefruit. jack wants to eat whatever you’re having, no, that thing in your hand right now give it to her. 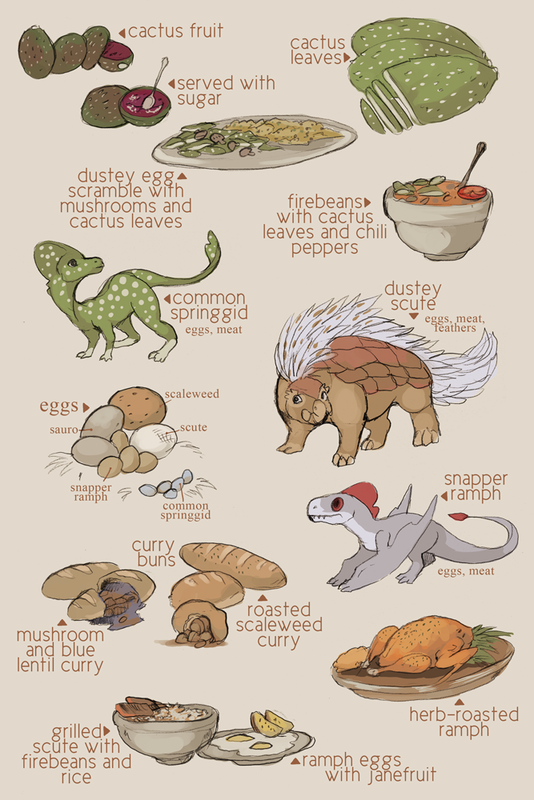 Mmm, mushroom/blue lentil curry bun sounds good, and I’d like to try janefruit.